and bends it to your advantage ..... The Sports Arbitrage System for placing arbitrage trades is simple and easy to follow. It can be used for most sports bets including racing in the US and around the world. Performing the calculations necessary for this arbitrage system is relatively straightforward especially if you stick to decimal odds eg 2.5, 3.0 etc. There are numerous conversion charts to be found on the Internet to convert from fractional and even US odds. First off we need to change the decimal odds to a percentage which is achieved by the simple expedient of dividing 100 by the odds eg 100/2.5 = 40%. Do the same for all the odds in your chosen event and add them together. If the result is less than 100 then an arbitrage system trade is possible. Suppose we are considering an arbitrage system bet from a tennis match between Nadal and Federer. One bookie quotes Nadal as 2.0 = 50.00% and another quotes Federer as 2.1 = 47.62% so adding the two percentages gives 97.62. This principal works for any number of possible outcomes for as long as the total percentage remains below 100%. To continue the tennis example consider 4 players to win the womens French Open at the semi final stage. Caroline Wozniacki 2.50 Kim Clijsters 3.75 Venus Williams 6.00 Victoria Azarenka 8.00. Combining the percentages 40% + 26.67% + 16.67% + 12.5% we get 95.84%. ie staking £95.84 the return would be £100 giving a risk free profit of £4.16. Calculating the stakes for each player is simple: £40 on Caroline Wozniacki, £26.67 on Kim Clijsters, £16.67 on Venus Williams and £12.50 on Victoria Azarenka. It's worth considering rounding the stakes up or down so as not to alert the bookmakers that this is an arbitrage system bet especially if large sums are involved. Also look for opportunities in the more obscure events to steer clear of opportunities in mainstream sports which are monitored by arbitrage system betting software and likely to be snapped up in the blink of an eye. Can horse racing ever result in guaranteed winnings? Yes, if you know about sports Arbitrage. Instead of going through one bookmaker to bet that each horse will win, however, you will place different bets with a different outlet. The theory behind arbitrage betting is that you will profit by arranging your bets to take advantage of the best odds offered by various bookmakers. By taking each individual outcome into consideration with the best odds possible, arbitrage betting is often referred to as surebetting - offering a sure way for gamblers to make money regardless of which horse wins. 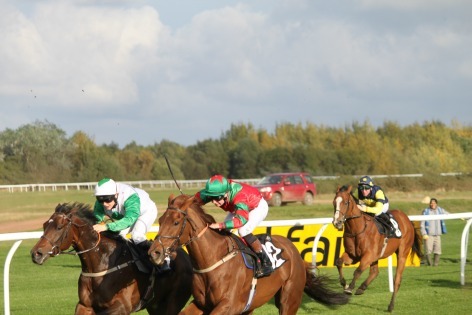 Horse racing events are held all year round, at venues located around the world. Because of the ability to find races at almost any time, you can place bets anytime. Once you get involved with horse racing, you may find that you have your own preferences over when to bet. For instance, you may find that you more enjoy betting when there are live races (as opposed to races simulcast from remote locations) at your local track. In the UK the racing is split into 2 main seasons - the winter for jumps racing (National Hunt) and flat racing on turf in the summer. Although inevitably there is a certain overlap. Also All Weather racing (on synthetic tracks) which are largely unaffected by weather conditions can be raced throughout the year. It is often said that the all weather racing is the most reliable in terms of results statistics as conditions remain the same for most races. 'There are a wide variety of bookmakers who would love to accept your bet for a horse race. Figuring out which bookmakers to use, whether you are looking to make straight, exotic or Arbitrage System bets, takes finesse. First, look carefully at the policies a bookmaker uses. Is there a minimum bet amount? During which timing will they accept bets? How fast are payouts made? All of these factors are very important to the health of your bet. Next, evaluate the bookmaker’s reputation. Beware of fly-by-night operations because you may place a bet and never see a return even when you win. Ask around, directly or virtually, to see what feedback is available for the bookmaker you are evaluating. Finally, look at the ease in placing a bet with a specific bookmaker. Is it as simple as a click of your mouse – or will you have to jump through hoops just to pick a horse? Unless the odds offered are phenomenal, it is smarter to stick with bookmakers who make the arbitrage system process easier. Like any sporting event, horse racing can be volatile. Any number of events can affect the outcome of races. By being aware of those circumstances, you can place smarter arbitrage system bets – or at least be prepared when a situation arises. Or focus on political bets where the market is less volatile. First, look at the overall health and racing schedule of a horse. Is one particular horse run in race after race, without adequate time for rest? This will probably not be the strongest competitor to bet upon. Also look at the racing history of a horse, are they racing against horses of comparable ability or has their owner placed them in a race against obviously stronger or weaker opponents? This can greatly change the outcome of a race. Next, look at the jockey that will be running the horse, and how long they have been working with that horse. Newer horse-jockey relationships can be rockier than established partnerships. Also, look to the temperament of the jockey - how hard do they push their horses? Are they known for last minute runs or fades? Finally, expect the unexpected. On any given day, the healthiest of horses can break a leg. At random times, a previously solid jockey-horse team can fall apart for no reason and ruin a perfectly sound arbitrage system bet. Slight condition changes at the track can throw a monkey wrench in the outcome. Like any other betting opportunity, never put all of your eggs in one basket & expect the unexpected, then you can bet smart.